Heading up the Iller Creek loop, toward the Rocks of Sharon. As the restlessness of summer kicks in, all it takes is a short drive and a good set of hiking shoes to get out of the city and into nature. For outdoor lover and local writer Crystal Atamian, the goal is usually to get out with her family to hike, bike or paddle each weekend. They set up their hiking daypacks at the beginning of the season, so they're ready to go whenever the trail calls. "My lens is through easy day hikes I can do with my kids," Atamian says. "I'm usually looking for something that's within a day's drive. I don't mind driving a couple of hours, but I prefer if the kids are in the car no more than 40 minutes." With a 6-year-old and an 11-year-old, she and her husband look for trips that will have some "point of interest" to keep the kids entertained. They've walked and biked part of the Columbia Plateau State Park Trail, an old railroad-turned-trail starting around Cheney, but "it just goes straight, and the kids hate it," Atamian says. "They absolutely cannot stand walking straight." So she looks for places that have some perk — a stream, wildflowers, a waterfall or a viewpoint. Located in Coeur d'Alene, the more-than-120-acre park has multiple trails, including a loop trail that goes around the hill in 2.2 miles. Since it's right on Lake Coeur d'Alene, you can jump in the water from time to time, Atamian says. Find more at cdaid.org (search for Tubbs Hill). Mount Kit Carson, the second-highest mountain in Washington's largest state park, offers great views. "It's a pretty wide, easy access trail," Atamian says. "Our 13-year-old dog can still make it up there. It's not a cakewalk, but it's still very doable for almost everybody." The "short, steep" trail to the summit will run you 7.5 miles round-trip, with 1,500 feet of elevation gain, according to the Washington Trails Association. Find more information at wta.org/go-hiking/hikes/mount-kit-carson-trail. This grassy conservation area is a 20- to 30-minute drive from downtown Spokane, offering views of Liberty Lake and easy-to-moderate trails for hiking and mountain biking. Find more at alltrails.com/trail/us/washington/saltese-uplands or wta.org/go-hiking/hikes/saltese-uplands. If you start from the north at the Iller Creek trailhead, a roughly 5-mile loop will take you past the Rocks of Sharon (also called Big Rock) about halfway through. The huge rocks "look out over the entire Palouse," Atamian says. "You can see at least about 30 miles." The rocks can also be accessed from the south via the Stevens Creek trailhead. Find more by searching "Iller Creek" at spokanecounty.org or at wta.org/go-hiking/hikes/iller-creek. North of Spokane Valley, the conservation area has several miles of moderate to difficult hikes and offers a view in all directions once you make it to the summit at Antoine Peak, according to Spokane County, which bought the area in recent years through the Conservation Futures program. Start from the west or east, and look for wildlife, wildflowers (early in the season) and expansive views. More at spokanecounty.org or wta.org. 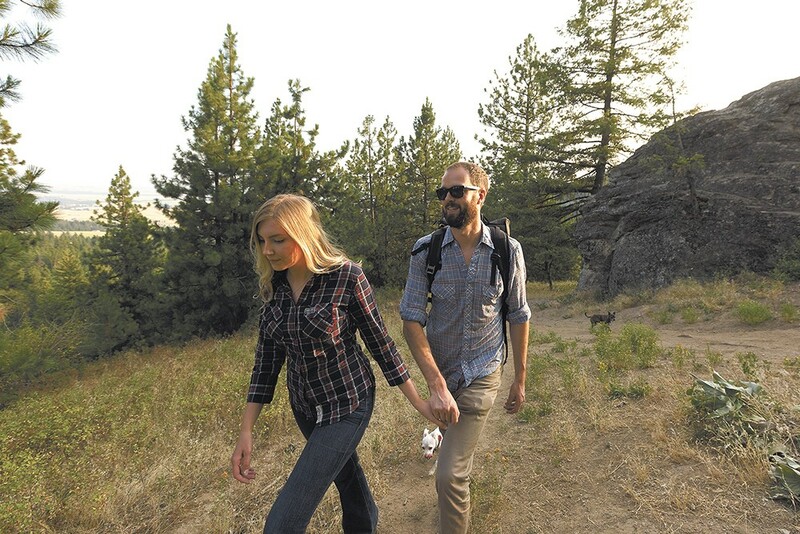 Luke Bakken, an avid backpacker and chair of the Spokane Mountaineers' conservation committee, offered a few suggestions for those willing to take a longer trip to spend time packing their way through the Inland Northwest's peaks. "If people are interested in going south of Spokane into the Blue Mountains outside of Dayton, Washington, Oregon Butte is a great hike," Bakken says. At about 3½ hours one way, the drive is definitely longer to get there, he says. But the 6-mile round trip in the Wenaha-Tucannon Wilderness "goes to the highest point in the Blue Mountains, and it's just got spectacular views," he says. "If you get there and the weather's right, you can see Mount Rainier and Mount Adams on a clear day." North of Spokane, head about 3 hours out of the city to the Salmo-Priest Wilderness in the Colville National Forest and find the 19-mile loop trail in the Selkirk Mountains. "Obviously you don't have to do the whole thing. If you start off headed north, you go through a beautiful cedar forest and down to the river, and that might make for a nice turnaround," Bakken says. Or head east, he says, and relatively quickly (within 3 or 4 miles) get up on a ridge overlooking Idaho and Washington. More at wta.org/go-hiking/hikes/salmo-priest-loop and fs.fed.us (search "Salmo-Priest"). For those really willing to take a long drive, about 5 hours south of Spokane you'll find the Eagle Cap Wilderness, in Oregon's Wallowa Mountains. You can start at Wallowa Lake State Park, which is beautiful by itself, Bakken says: "It looks like the Alps. There's just these towering mountains that come out of nowhere." If you're up for it, there's a difficult but rewarding hike of more than 15 miles to Ice Lake. Aside from the 10 essentials you should always bring on any hike, the Inlander asked Crystal Atamian what else she recommends packing along. "As far as the stuff in my backpack, it sounds really odd, but you need toilet paper and some wipes and hand sanitizer in a bag," she says. It's less of an issue now, but when her kids were smaller, it seemed like every time they went out, there was a needed bathroom break along the trail. "I had a compass, something to make a fire with, and I'm thinking, 'Alright. If we get stuck, we're set,'" Atamian says. "What it turned out we needed was wet wipes." Don't know what the 10 essentials are? Generally, it's accepted that you should bring along: navigation (map and compass), food, water, something to start a fire, a flashlight, first aid kit, sun protection (sunscreen and sunglasses), extra layers (a raincoat or jacket), tools (shovel, pocket knife, etc.) and shelter (tarp, emergency space blanket, etc. ).